When choosing the color scheme for your blog, the possibilities are nearly endless. With inspiration around every corner, it can make it difficult to narrow down the options. Fortunately, there are ways of approaching your color choices that won’t leave you grasping at thin air. Let’s take a look at 4 strategies for doing just that. Pinterest is one of the most amazing tools available for finding inspiration. 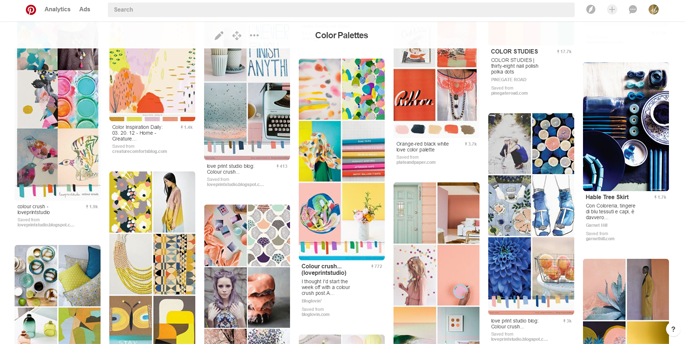 We’ve created a color palette board here that is packed with gorgeous color palette inspiration. If you don’t find anything that interests you there, search for other color palettes using the search bar. Create a board for this and start pinning any color palette or photo that appeals to you. After you’ve compiled about 20-30 pins you’ll most likely start seeing a pattern in the colors you are drawn to. This should help you narrow down your colors to a palette best suited for your blog. 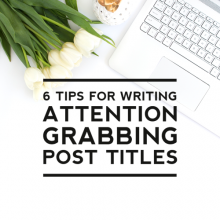 This does not have to be an image you’re actually planning on using on your blog, but it should be an image you find visually pleasing or, if you’re designing for a client, that somehow adheres to any brand colors or to their imagery guidelines. Keep in mind the way it makes you feel, as the colors in this image can subconsciously inform tone and mood wherever they’re placed. Once you have an image, pull one or two of the dominant colors from this image and place them together on your blog. If you like what you see, add other colors into the mix as accent colors. These can be used sparingly in areas where you want emphasis. Continue to mix the colors around until you find a combination that’s visually pleasing. 1. If you’ve already got a reference image that is on your computer, there is an online resource called Pictaculous, which allows you to upload a photo to find a palette that works best with the uploaded image, then obtain the generated color palette through RGB and HEX values, Adobe swatch files, email and more. 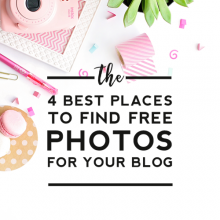 This will provide a great start if you already have imagery chosen for your blog. 2. If you don’t have the image but want to focus on a certain color, try the Shutterstock Color Spectrum. By using a simple slider, you can pick and choose stock photography to sync with any color scheme you might have in mind. You can also use keywords to help search for the perfect imagery for your concept. One of the nicest things about using a tool like this is that it takes you more directly through what will be the consumer’s experience of any imagery you choose, helping you to better target your audience and choose web-safe colors. If you need a little more guidance right off the bat, use an online color palette generator and let the math do the work for you! These sites can be helpful when you need to see a visual representation of your color palette and quickly translate the color values you see for online use. 1. Kuler, one of the original color palette resources run by Adobe. 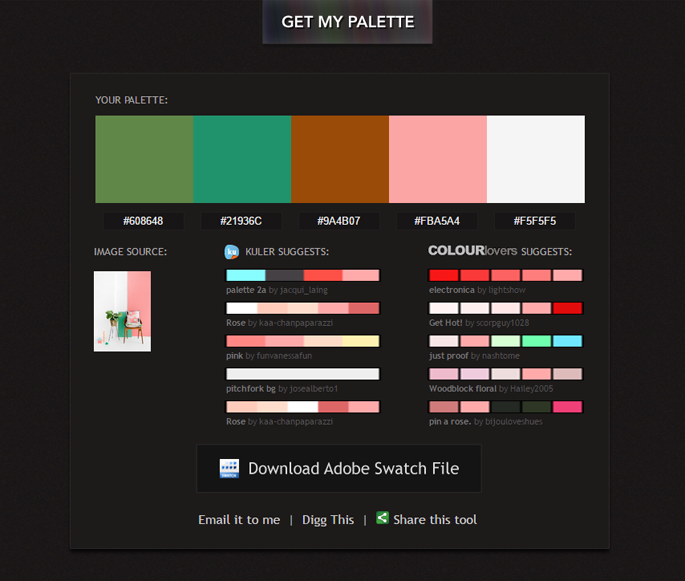 Users can create custom color palettes that are downloadable and rated by others in the community. If you have an Adobe ID, or sign up for one (it’s free), you can then download these swatches for use with any Adobe product. 2. 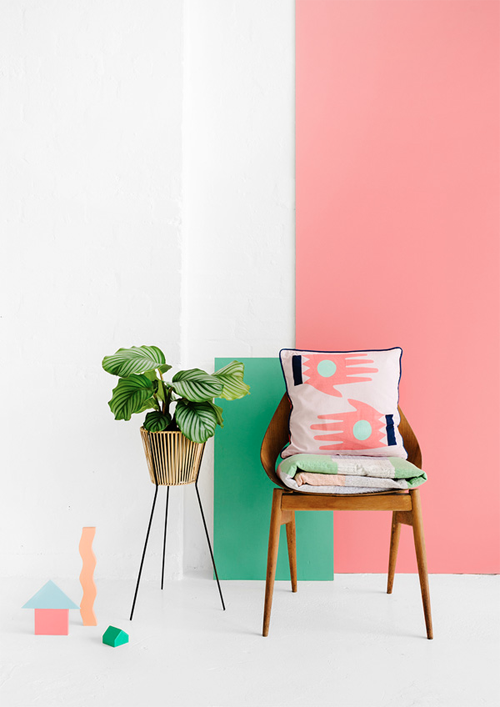 ColourLovers, a huge color inspiration site that allows you to find colors, patterns and palettes based upon channels, trends, and more. Through their “Colors” link, you can instantly see the HEX and RGB values for the colors you like, or select the color and create a palette or pick stock photography that leverages the same color. Remember not to focus on only your favorite colors, but rather to use them as a starting place from which to expand. You might begin, for instance with blue and then add a neutral color or two. Then you could try adding non-typical colors to help give a well-rounded variety of values. Finding a sampling of websites that have similar topics can reveal a common thread in the colors used to represent them. Knowing that these colors are inspired by food and have also been successful when used on other recipe sites can help validate and determine a good starting point for your color scheme. 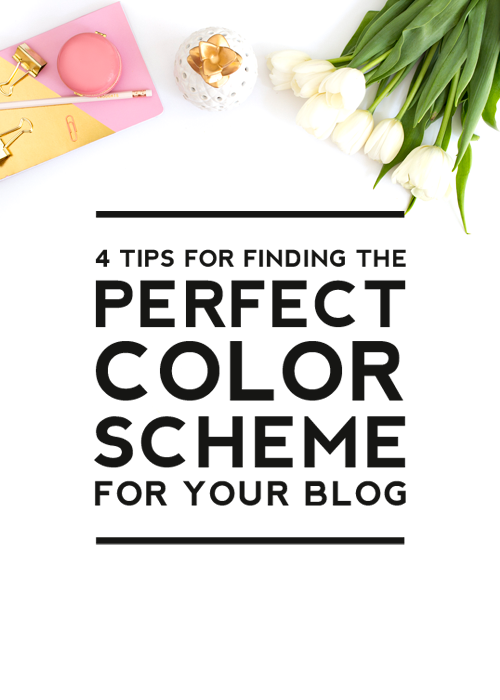 Finding the perfect color scheme for your blog can seem like an intimidating prospect at first, but with these four methods, it’s really not so hard. In fact, the process of searching for your color can inspire even the written tone and voice for your blog, as well as your content. So dig in, have fun, and make those colors pop! Design = Art. Good post ! These color charts are amazing, what a great way to make scrapbook examples via colors for inspiration. Thanks so much for this post! 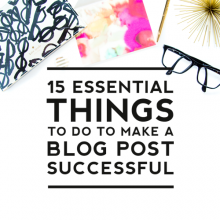 I’m just getting started with designing my blog so this was really helpful. Thank you for the links too! I find it helpful sometimes to look at smaller palettes of color and then refine. I’ve designed a bunch of custom WordPress themes, and I usually actually begin by looking at a palette of web safe colors. I know web safe colors aren’t necessary anymore (since nearly all computers support millions of colors), but it’s nice to have a limited set to work with at FIRST, and then to refine to the exact colors you want. I’d particularly recommend http://websafecolors.design/ though a google search for “web safe colors” will yield a lot of websites you can use for a starting palette. Nice article! I think it is helpful to design a blog.